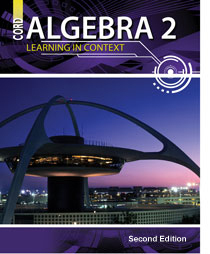 CORD set the standard by creating the first truly contextual-based Algebra 2 textbook in 2008. Now Common Core Standards are requiring that all mathematics be taught in a manner that is "robust and relevant to the real world, reflecting the knowledge and skills needed for success in college and careers." CORD has been putting that idea to work for over 30 years. Just in time to meet these new standards, the experts in "performance task" based learning announce the launch of CORD's Algebra 2: Learning in Context, Second Edition digital textbook – the guideline to strengthening those "real-world" concepts and proving more students can be successful in math. Click here or on the image to the left for a brief tour through the features and benefits of CORD's textbooks. Contact us today and see for yourself how the nation’s leading experts in contextual teaching have perfected the ideals of Common Core. 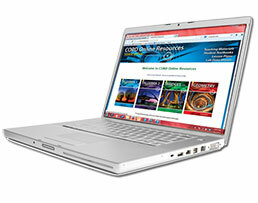 CORD’s Learning In Context mathematics materials have gone digital. The same proven hands-on learning only in electronic format. Contact Us Today for your preview access to the teacher's material or for more information on pilot programs. Workplace Applications, real-world examples, labs and activities fit perfectly with the Common Core Standards mission statement of: " The standards are designed to be robust and relevant to the real world, reflecting the knowledge and skills that our young people need for success in college and careers." Online access to the Teacher's Editions and all ancillary products is complimentary with the purchase of 20 student texts online. Printed materials are not included in the online package and shall be considered additional costs for the purchaser. For Home School usage, please contact CORD Communications at: 800.231.3015, ext. 375 or details@cordcommunications.com for pricing and package details. Check here to see if we have correlations for your state standards or to download state-specific supplemental material for your math course. Click here to locate your local representative. CORD Communications strives to produce error-free materials. However, mistakes do happen. If you find errors in the textbook, please click here to tell us which book, page number and problem number. Provide a brief description of the error. We will look into the error and post any corrections needed to the website.